I’m what you would call a morning person. I usually get up at 6 AM – at least on weekdays – and go for a walk, then have breakfast and shower. By 7:30 I’m ready to roll. On weekends, I might sleep in until 8:30 or so but often I eschew that for railfanning. On Wednesday evening, April 10, I checked VIA Rail’s web site to see how the westbound “Canadian” was doing. They were on time, due into Winnipeg by 8 AM on Thursday the 11th. I also checked the weather and it was going to be clear overnight and on Thursday morning, so there was a good chance of a nice sunrise. I knew by experience that VIA could easily be in earlier than 8 if they were on time, so I decided to get up at 5 AM and hit the road. My alarm went off. I got up and dressed quickly, then threw my coat, toque and gloves on, grabbed my camera bag and hit the road. There was a little light in the sky to the east but not much. I reached the Dugald Road and pulled off to check the VIA web site again. They were at Nourse, 21 miles from Dugald, so I didn’t have to rush. I drove to the first crossing east of Dugald and parked there. I put my video camera on a tripod, took a few test shots, and waited. It was still pretty dark at 6:06 AM. I waited and watched to the east. 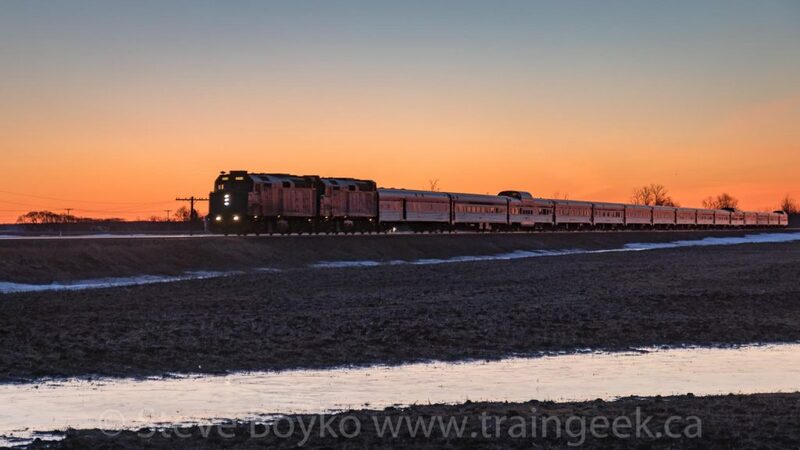 VIA’s web site showed the “Canadian” coming to a stop in Anola. I was a bit confused about why they would stop there, as I hadn’t seen an eastbound train and the signals didn’t indicate a train coming west. Who knows? I amused myself by taking a few photos at the crossing. I decided to relocate east. My thinking was that if they were going to stay in Anola, I could photograph them while they sat there. When I make those decisions, I’m always afraid that the train will come while I’m driving to the new location. It’s happened before… too many times. As I drove east, I kept an eye on the trackside signals. They were all dark, which meant that no train was nearby. After a few kilometres, I took a side road to a crossing. I saw headlights well to the east, so it was time to set up. By this time (6:30 AM) it was considerably lighter – the sun was almost over the horizon. I decided that there was enough daylight to fly my drone, so I unpacked it and launched it as I heard VIA’s horn blowing for a crossing. I even remembered to start recording. 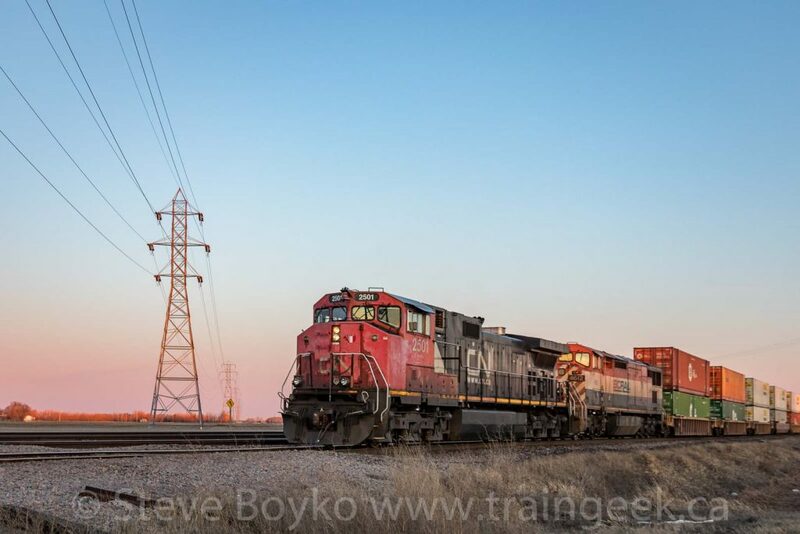 I started photographing the “Canadian” as it approached. I had the wide angle lens on my camera as I wanted to capture the sunrise sky. I elected to leave the drone hovering and recording and concentrated on my photography. I find if I try to do two things at once while railfanning, I do neither one well. The DJI Mavic Air drone is a rock solid camera platform, so it’s easy to “let it be” and it will produce very steady video. My starting camera settings were 1/50 second shutter speed, f/2.8 aperture, and ISO 200. 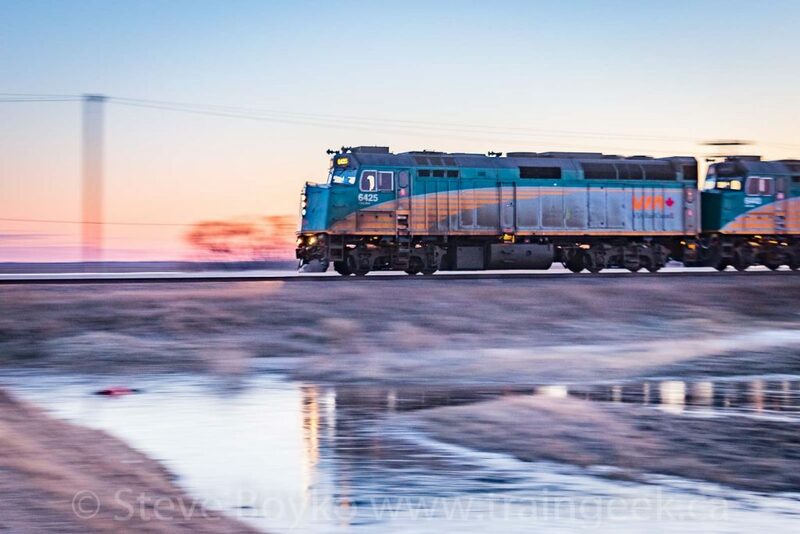 As the train approached, I used the dial on the camera to spin the shutter speed faster, to 1/125 second, to have a chance of freezing the train in place. VIA wasn’t going super fast so it worked this time. If they were going 60+ MPH, 1/125s would not have been nearly fast enough. There is some blurring if you look closely enough, but it’s “sharp enough” for me. I spun the dial down to 1/25 second for a few pan shots as the head end passed by. Since I wasn’t shooting toward the bright sky, I needed to bring the exposure up by keeping the shutter open longer. This was the best of the pans. I switched to operating the drone after that, and panned that as the train passed by on its way into Winnipeg. You can see the video below. I landed the drone quickly after VIA left, as it was time to get home and get ready for work. Flight time? 3 minutes 34 seconds… most of which was spent waiting for the train to arrive. As I drove home around the Perimeter Highway, I noticed a train waiting to leave Symington Yard. I had a few minutes, so I exited and photographed it. Why not? In retrospect, I should have waited another minute at most for the sun to actually crest the horizon so it would light up the side of the train. I’m still happy with the photo. Astute Canadian readers of a certain age will have noticed that I’ve been using April Wine song titles throughout this post. April Wine was big in the 1970s and early 1980s and I was a big fan. They came out of Halifax and had a string of great songs. That ringing bell at the start of “Oowatanite” sounds like a crossing bell to me, even though it’s supposed to be a fire bell. Were you a fan of April Wine? Leave a comment. Another thing. I remember chasing CP’s Canadian (same train – different era). him flying past me on an outside curve. Sometimes you have to ignore the camera and just enjoy the moment! hi Ian, glad you agree! 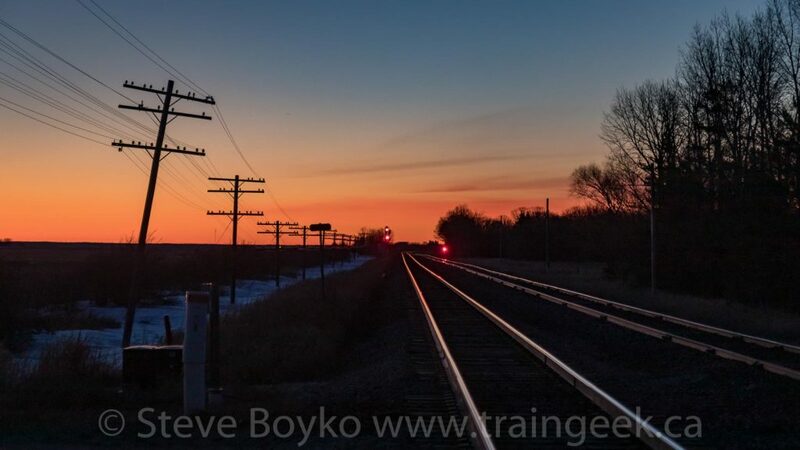 Sometimes it is nice to just watch the train go by… be involved in the moment rather than worrying about shutter speeds and composition… enjoy the moment. Just Between You and Me, the April Wine song titles did not hit me until Just Between You and Me. Then the bell went off in my head. Maybe it was a fire bell, maybe it was a crossing bell.